Our Young Man Is Singing! 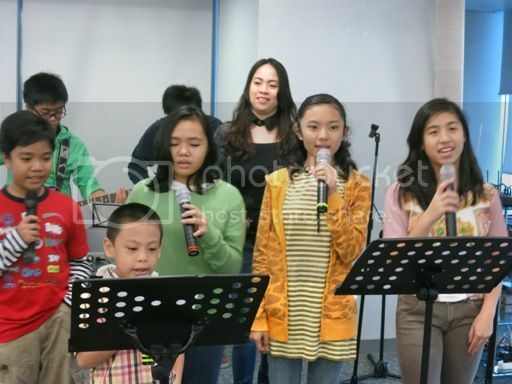 Just sharing a proud mommy moment when my 6-year-old son joined the Sunshine Kids of the Harvesters Christian Fellowship during praise and worship last July 29, 2012. At first, he was hesitant to join because he wasn’t really an active Sunshine Kid member, but I convinced him to participate by telling him he’d be able to use his Dad’s iPad when we get home. That strategy worked! I always get goosebumps when I see my son perform. I guess all moms are like that. I also look forward to seeing him more on stage or in front of an audience in school and in church. This entry was posted in Harvesters Christian Fellowship, Praise and Worship, Sunshine Kids. Bookmark the permalink. 4 Responses to Our Young Man Is Singing! Mahiyain ba sya? Good for him para masanay sya! Ako nga frustrated singer e. lol! oh,my! how cute….way to go! Awww that is just too adorable! Keep it up Justin! Thank you for joining Color Connection last week, the linky is up now for this week. I’m excited what color you would showcase this week.